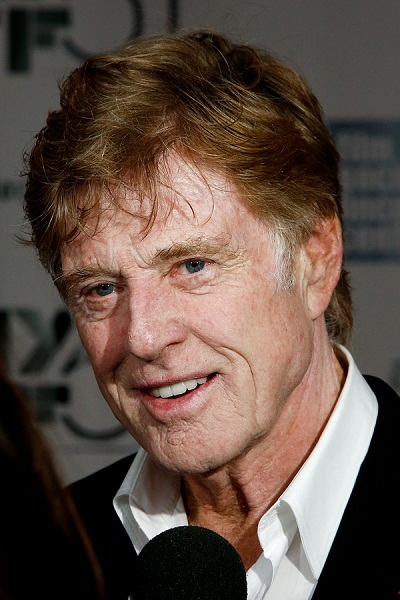 Robert Redford is an American actor, director, producer, businessperson, environmentalist, and philanthropist. He won the Academy Award for Best Director for Ordinary People (1980). Robert is the son of Martha (Hart) and Charles Robert Redford. His ancestry includes English, Irish, Scottish, Northern Irish/Scots-Irish, and Cornish, including recent immigrants. Robert’s mother’s family has lived in the United States for many generations. Robert is married to Sibylle Szaggars. He has four children with his former wife, historian and environmental activist Lola Van Wagenen, including actress, director, and producer Amy Redford. Robert’s patrilineal ancestry can be traced back to Peter Redford, who was born, c. the early 1700s, in Manchester, Lancashire, England. Robert’s paternal grandfather was Charles Elisha/Elijah Redford (the son of Charles Redford and Jane Archie). Robert’s grandfather Charles was born in Connecticut. Robert’s great-grandfather Charles was born in Rhode Island, to English-born parents, of English and Irish ancestry, Elisha Redford, who was born in Manchester, Lancashire, and Mary Ann McCreary. Robert’s great-grandmother Jane was Scottish, born in Aberdeenshire, the daughter of William M. Archie and Jane Little. Robert’s paternal grandmother was Lena Taylor (the daughter of Henry Taylor and Mary Tucker). Lena was born in England. Henry was born in Cornwall, the son of Jonathan Taylor and Elizabeth Crocker. Mary was also born in Cornwall, the daughter of William Tucker and Grace Tremberth. Robert’s maternal grandfather was Archibald Woodruff Hart (the son of John Gabriel Hart and Ida Woodruff). Archibald was born in Missouri. John was the son of James Carmichael Hart and Mary Elizabeth Long. Ida was the daughter of William Henry Woodruff and Julia Hannah Jackson. Robert’s maternal grandmother was Sallie/Sally Pate Green (the daughter of Eugene E. Green and Martha “Mattie” Bugg). Sallie was born in Texas. Eugene was the son of Edwin/Ed Jeremiah Littleberry Green and Eliza Jane Young. Martha was the daughter of Zachariah Pennington Bugg and Emily/Emma Jane Davis. The name Redford originates from Midlothian in Scotland (a few miles from where I live). I would say he is more Scottish than anything. That doesn’t necessarily mean he’s more scottish. He just has a scottish name. He also looks Scottish and has lots of Scottish surnames in his family tree. You have referred to the Scottish as mixed multiple times, citing the same articles that are based on one study. Tell me, to what degree do you think the average Scot have non-European ancestry? 30%? 40%? Assuming the average Scot actually has “West African, Arabian, south-east Asian and Siberian” ancestry (which is doubtable; your articles state that 1% of Scots have Berber ancestry, far from average), I’d be surprised if these ethnicities account for more than 1% or their ancestry. Would this really make them an “‘extraodinarily’ mixed people”? You mean ”the same article”, because he keeps spamming the same article over and over again. How his IP doesn’t get blocked is beyond me. They aren’t any more mixed than the Irish, English or Welsh. That article is just a “spiel” and doesn’t explain anything much at all. It is basically a typically misleading newspaper article. It is just talking about ydna and making fairly broad assertions from that ydna. Regarding the article Tom Conti for example has a mother of Irish ancestry and his father is Italian.